79% of people who leave their jobs say they felt underappreciated. Recognition is the #1 thing that employees say would inspire them to be more engaged at work. When most of us hear this, we immediately think about how the workforce is changing. People want to be rewarded constantly for their work. But that's not actually the case. People feel under-appreciated when they can't see the connections between what they do on a daily basis and the end result. How are they impacting the many stakeholders? It's important that you have systems in place that help your team members understand the larger picture to which they contribute in their risk-based roles. Let's explore 5 simple strategies to put in place now and help your team understand impact. You may already be thinking, we don't have time to take a field trip. We have work to do. But consider this. When you were in school, someone could have described quite in-depth what it was like to work at a major newspaper, a courthouse or the state capitol building. They could have even shown you a video. But until you saw it for yourself, it was impossible to translate it into a clear understanding of the place and the people. In most business settings, everyone is living in a silo. This can be especially true for risk-based teams. We're often reviewing numbers and data. It's easy to forget that there are real people being impacted by every audit we complete. Team members can, therefore, feel detached from the impact they're having on other teams, the business, clients, and the industry. Set up an opportunity for your team to meet the stakeholders. Give them the opportunity to see the places where what they're doing is improving business outcomes and the lives of others. When they better understand the why and not just the how, they'll be more engaged in their work. The mastermind group isn't exclusive to executives. The basic concept is the same. A small group of Individuals with different job roles come together regularly, perhaps one hour per week, changing to once a month as the group progresses. They discuss their roles, challenges, goals, best practices and more related to their department or team. Before the meeting, they agree on a general topic to discuss. This allows each person to plan and helps the group stay on track. An individual who takes part in a mastermind group has a better understanding how what they do impacts people they don't normally see or interact with. Start small within your department, matching people who have different job roles in groups of 3-5. If you have the opportunity, work with other department leaders to diversify the groups. We all get more efficient and produce better business results when we're exposed to a less homogenized work environment that helps us see outside of our own job roles. There are certainly items discussed in manager meetings that are well over the head of an employee who doesn't normally attend that meeting. But exposing direct reports to what's happening in the upper echelons of a company is a great way to help your team members make connections. Former Verizon Executive and Leadership Trainer, Karin Hurt says, "Giving people exposure to the conversation and thought process, not just the outcomes of strategic decisions, goes a long way in helping people connect the dots." 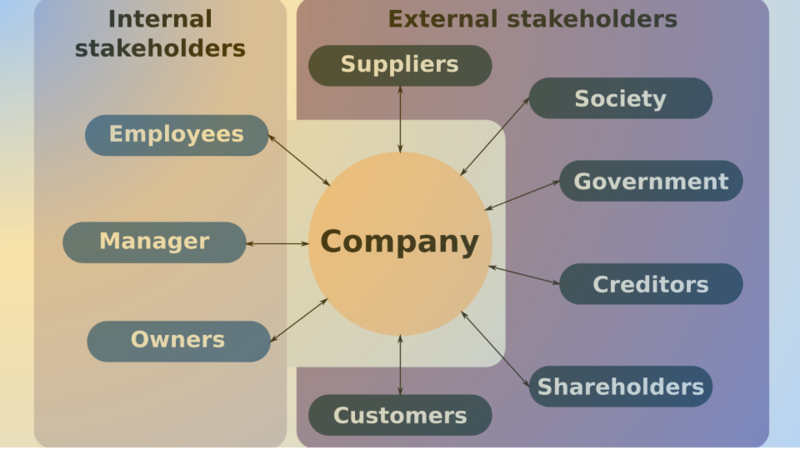 Within many organizations, stakeholder impact is only shared through one or a few small channels. It may come in the form of an annual revenue report. It may be the achieving or maintaining of a certain state or organizational ratings thanks to your team's diligence in performing internal audits. Often these opportunities to show impact are few and far between. That's a problem. We need to stay motivated every day to do our best, or we start to feel complacent. Great reviews that the company receives online. Make sure employees understand how they contributed to that great review by properly helping assess and mitigate risk. Other teams' successes. If another team passes their audit, this is thanks in part to the auditing team's emphasis on promoting safety and compliance. If they don't pass, it's an opportunity to share insights that will help another team improve. Either way, there's a clear connection between your the two teams. You share in the desire for a positive outcome and celebrate it together. Team members feel more connected to stakeholder outcomes when they can see how a change that they make impacts those stakeholders. Creating a culture of learning, continual improvement and innovation helps establish a positive correlation between an individual or a team's efforts and a positive outcome. When this is in place, your team members are more engaged and will perform better in their risk-related duties. We all produce more efficient, compliant, quality work. Are you struggling to help your risk-based team understand stakeholder impact? Sign up for access to exclusive resources.